Time flies by and taste is moving. Long-term values lasting for now and future generations are rare. Najee‘s music is such a seldom companion through our whole life. In this surf of changing fashion he is the rock of consistency. His newest project Poetry In Motion will be released August 25, 2017 on Shanachie Entertainment. By the way his fourth release on this veritable label. 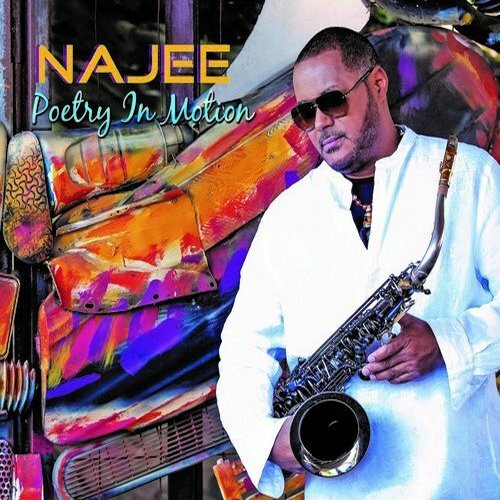 Najee performs on the album soprano, tenor sax and flute. As used by his projects Najee has again surrounded himself by a large group of musicians. Among the listed musicians are Barry Eastmond, Matt Cooper, Mike Logan (keyboards), Blake Aaron, Bluey, Richard Bull, Randy Bowland, David P Stevens (guitars), Catl Carter, Francis Hylton, Michael Manson (bass), Jermaine Parish; Francesco Mendelia (drums), Victor Williams, Joao Castano (percussion), Eric Roberson, Will Downing (vocals), Bobby Lyle (piano), J.J. Williams (drum overdubs), and Rod Bonner (keyboards, bass guitar and drums). The stratosphere is the second major layer of Earth’s atmosphere, just above the troposphere, and below the mesosphere. The unique feature of this song compared to many competitors in the smooth jazz genre is the remarkable flow of the melody without any overdub or programmed superstructure. Just Najee and his instrument in pure coincidence.